Cute Home & ready to move in. Exceptional location. Interior street, Side by Side parking, Beautiful Mountain Views, Spacious covered patio that could be larger, two storage sheds, low maintenance landscape & Open floorpan. A buyer could move in & enjoy or make this home a real showcase. Enjoy the Vaulted ceilings when you enter this home. Many windows to allow lots of natural light. Family room has a skylight & slider that leads to spacious patio. Master bedroom is spacious & walk in closet. Master Bath has walk in shower. Guest bath has tub/shower combo. Laundry room has lots of storage, room for utility sink or small refrigerator. Kitchen has small built in table for two, lots of counter space, many cabinets, gas stove, newer refrigerator & built in oven. Furnishings are negotiable. HOA includes GOLF. 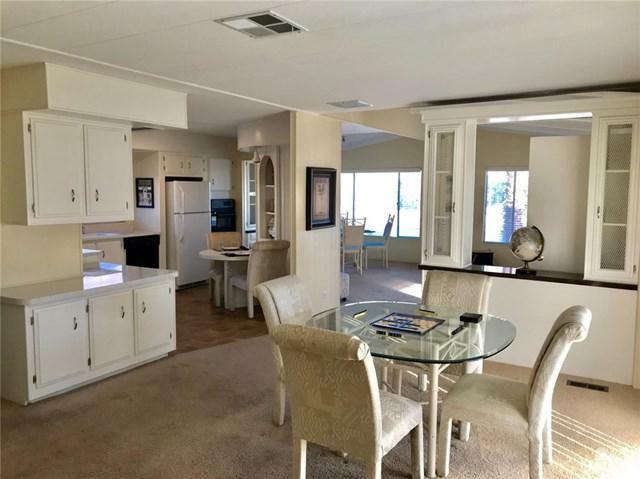 There is a clubhouse, restaurant, full gym with great equipment, lounge, pools, tennis, pickle ball, bocci ball, shuffleboard & 18 hole golf course.